Can you tell us a bit about        away now, which is great too. and your furry friends to GemLife Highfields. 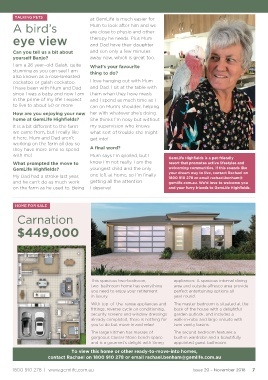 I am a 26 yearâ€“old Galah, quite    thing to do? to live to about 50 or more. her with whatever sheâ€™s doing. we came from, but I really like    A final word? you to do but move in and relax! twin vanity basins. and is a gourmetâ€™s delight with Smeg       appointed guest bathroom.